The Writers Room… One whole day writing an episode of a TV show. 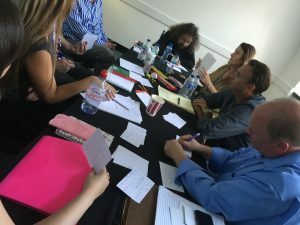 We will fling successful applicants right in at the Screenwriting deep-end by recreating an authentic one day long Writers’ Room experience (to be run Thursday BEFORE the main festival). Created by BAFTA and EMMY Award winning Screenwriter Barbara Machin (Waking the Dead), the LSF Writers Rooms will give successful applicants a look behind this slightly mysterious curtain and offer a real life experience of collaborative creative writing under pressure; all delivered while under the guidance and leadership of some of the best professional Showrunners working in the UK today. Expect to be challenged and fulfilled in new and exciting ways you’ve never experienced before – we’re going to take you so far out of your comfort zone, you’ll never want to come back! 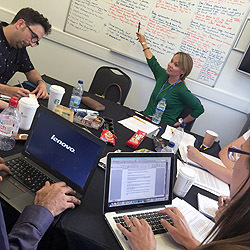 The Writers Room will run for a whole day on the Thursday of festival week (Thursday 6th September 2018) at Regent’s University. Medical, crime, sci-fi, comedy, drama, period drama and long running series (soaps). The genres we choose will be dependent on the showrunners we can get to commit to the experience. Each room will be headed up by a professional Showrunner who specialises in the genre. The Showrunner will select a specific cancelled TV series which selected participants will be expected to research extensively ahead of their Writers Room experience. The day will start with a group briefing by the Showrunners, covering the basics of the experience, how the rooms will run (ground rules and etiquette) and the ultimate aim of each one. Participants will then separate into groups and join their Showrunner in their writers room. The aim will be to create a detailed 3-5 page step outline for an episode of their designated Television series. 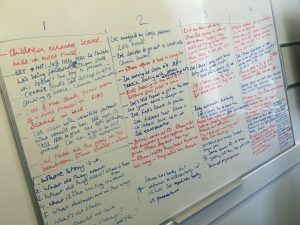 This will simulate a real-world experience of collaborative writing under pressurised conditions with a real deadline. * Note there may be additional requests from the individual Showrunners that follow. All submissions will be read by the LSF reading team with the Showrunner making final decision and thereby shaping their own Writers Room from a shortlist. Six places are available on each Writers Room and you MUST be a full delegate of LondonSWF to apply. ‘The Writers Room was everything I hoped it would be – a real eye opener into the workings of a flagship continuing drama. It created a lovely atmosphere where any idea could be put on the table then morphed, stretched, hammered and even thrown out entirely. The work itself was an absolute joy and a real chance to put into practice the various lessons I’ve learned through years of sessions, advice and tutorials from LSF and beyond. Ed Connole, Screenwriter – 5 Stars! 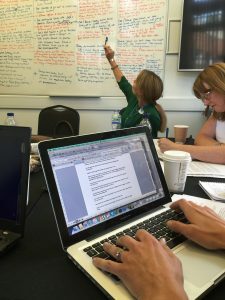 Join Showrunner Loretta Preece in this day long Doctors focused Writers Room experience brought to you exclusively by the LondonSWF.